There is a science to food and wine pairings. Wine has four essential components: acidity, tannin, alcohol, and sweetness (or the lack thereof). Those same components are also found in foods. So when it comes to pairing wines with various foods, the idea is to find flavor profiles that complement each other, either through contrasting elements, or matching similar ones. “You’re basically looking for same or opposite,” Chicago-based sommelier Julia Burke told Gizmodo. So how did each cookie-and-wine pairing fare? Here are our rankings, from best to worst. This was by far the best match-up, featuring a crisp, light Riesling that wasn’t cloyingly sweet. Everyone was unanimous about how well the buttery simplicity of this simple shortbread cookie paired with the wine. “Riesling is known for its acidity, as well as a sweetness to balance that out,” Burke said. 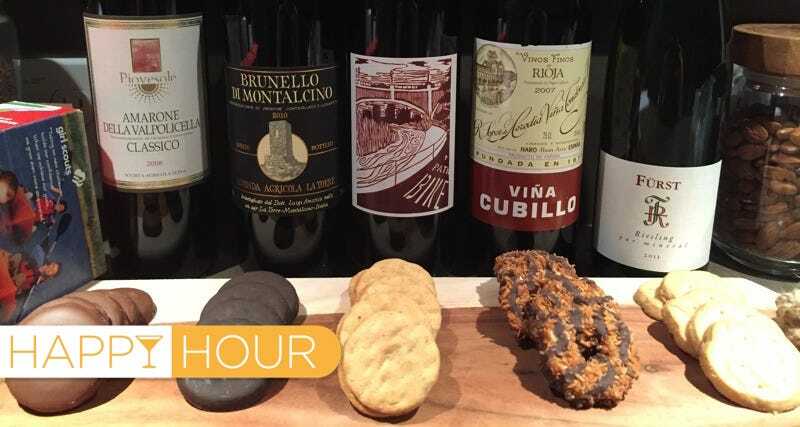 That acidity cuts through the fat and butter that forms the base of the shortbread cookie—a contrasting element—but the tinge of residual sugar in the wine matches the cookie’s sweetness. A light sparkling rosé might also pair well with a Trefoil, so long as you avoid the super-dry (Brut) bottles. It has to be said: this was not a very good Rioja. As Gorostieta observed, “This is more of a table wine for the end of the party when you’re already drunk.” But something magical happened when we took a bite of Samoa cookie, followed by a Rioja chaser. The cookie brought out notes of coconut, cloves, and cinnamon in an otherwise undrinkable wine, making it pleasantly palatable. That’s the genius of a really good pairing. Here’s a pairing that will take you straight back to the beloved flavors of childhood. The combination of a young, very jammy Zinfandel and the “straight-up peanut butter bomb” (per Carroll) of the Do-Si-Do tastes just like a peanut butter and jelly sandwich. And no fancy organic peanut butter and artisanal jam, either. We’re talking Jiff and Welch’s grape jelly. Burke said it’s the low tannins and big juicy fruit flavor of the Zinfandel that makes this combination work. A California Grenache might be good too. Our luck had to run out eventually, and this proved to be our first miss, even though the Brunello was everyone’s favorite wine on its own. And who doesn’t love a good Thin Mint? But together, they were disastrous. Some tasters reacted more strongly than others: “It makes my tastebuds angry,” Trimble declared, while Mora said the first bite “sent me into sour convulsions.” The overall effect was unpleasantly similar to toothpaste and orange juice. One word: blech. This was the only pairing that made both wine and cookie taste worse—the opposite of what you want to happen. The culprit here may have been the salt in the peanut butter clashing with the high tannins in the otherwise excellent Amarone. “Salt and tannins don’t play nicely together,” Burke said. “Try some bar peanuts and watch how fast they kill your wine. If there’s a lot of tannin in your wine, the salt will find it.” She recommended a sweet ice wine to pair with saltier fare. Other possible pairings include matching Lemonades with a crisp, citrusy Prosecco. And Malbecs are a surprisingly good match for several types of Girl Scout cookies. They’re like the Goldilocks of wines: just enough tannin, sugar, and acidity to be really flexible for food pairings. But when it comes to pairing Thin Mints and Tagalongs, take our advice and stick with milk. To find Girl Scouts selling cookies near you, visit www.girlscoutcookies.org or use the official Girl Scout Cookie Finder app, free for your iOS® or Android® phone or tablet.